"25 Years of formation TMR"
The reverse: in the center - in the rays of the rising sun image is a symbol of peace doves flying over the inscription - "ПРИДНЕСТРОВСКАЯ МОЛДАВСКАЯ РЕСПУБЛИКА" (Pridnestrovian Moldavian Republic), on the right inscription - "25 ЛЕТ" (25 Years), at the bottom of the PMR stylized flag ribbon inscription - "1990-2015". The obverse: in the center - the image of the State Emblem of the Pridnestrovian Moldavian Republic; along the rim - inscriptions: at the top - «ПРИДНЕСТРОВСКИЙ РЕСПУБЛИКАНСКИЙ БАНК» (Pridnestrovian Republican Bank), at the bottom - the Year of issue "2015"; in the upper part of the coat of Arms - the denomination "25", at the bottom under the arms - "РУБЛЕЙ" (ruble). The reverse: in the center of the disc in the sun close up the words (25 years), under it - a stylized ears of corn; inscription along the rim - "ОБРАЗОВАНИЯ ПРИДНЕСТРОВСКОЙ МОЛДАВСКОЙ РЕСПУБЛИКИ" (formation Pridnestrovian Moldavian Republic). The reverse: in the center - the image of two crossed caduceus, which is an element of the emblem of the customs bodies of the PMR, above it - the inscription "25 ЛЕТ ТАМОЖЕННЫМ ОРГАНАМ ПМР" (25 YEARS TO THE CUSTOMS AUTHORITIES OF THE PMR); below - the inscription "2017", the image of the laurel branch. "25 th Anniversary of the Pridnestrovian Republican Bank"
The obverse: in the center - the State Emblem of the Pridnestrovian Moldavian Republic; along the rim - the inscription: at the top - «ПРИДНЕСТРОВСКИЙ РЕСПУБЛИКАНСКИЙ БАНК» (Pridnestrovian Republican Bank), at the bottom - the Year of issue "2017"; at the bottom under the arms - the denomination «25 РУБЛЕЙ» (25 rubles). 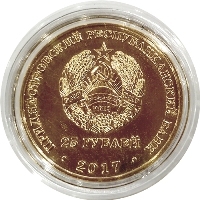 The reverse: in the center - a graphic image of the Ruble, framed by a spike; under it - the inscription "25 ЛЕТ ПРБ" (25 YEARS OF PRB). Series "Republic. Values, events and persons"
"25 Years of the Bender tragedy"
Series of coins "Memorable dates and events of Transnistria"
The obverse: in the center - the image of the State Emblem of the Pridnestrovian Moldavian Republic; along the rim - inscriptions: at the top "ПРИДНЕСТРОВСКИЙ РЕСПУБЛИКАНСКИЙ БАНК" (The Pridnestrovian Republican Bank), at the bottom - the denomination "25 ЛЕТ" (25 rubles); at the bottom under the arms - Year of issue "2016". The reverse: in the center of the disc of black enamel - the inscription "АГРОПРОМБАНК" (AGROPROMBANK) on the background of numbers "25". The reverse: in the center of the disc of blue enamel - the inscription "АГРОПРОМБАНК" (AGROPROMBANK) on the background of numbers "25". The obverse: in the center - an image of the State Emblem of the Pridnestrovian Moldavian Republic; on a circle - inscriptions: at the top - "ПРИДНЕСТРОВСКИЙ РЕСПУБЛИКАНСКИЙ БАНК" (PRIDNESTROVIAN REPUBLICAN BANK), at the bottom - "25 РУБЛЕЙ" (25 RUBLES). The reverse: in the center - the logo of the "Pridnestrovian Savings Bank"; at the top - the inscription "25 ЛЕТ" (25 YEARS), at the bottom - the inscription "ПРИДНЕСТРОВСКОМУ СБЕРБАНКУ" (PRIDNESTROVIAN SBERBANK). The obverse: in the center - the image of the State Emblem of the Pridnestrovian Moldavian Republic; inscriptions along the rim - on top: «ПРИДНЕСТРОВСКИЙ РЕСПУБЛИКАНСКИЙ БАНК» (Pridnestrovian Republican Bank), at the bottom - the Year of issue "2018"; at the bottom under the arms - the denomination "1 РУБЛЬ" (1 ruble)"
The reverse: in the center - the inscription «ЭксимБанк» (EximBank), at the top - the logo of OJSC "Eximbank", at the bottom - the inscription «25 ЛЕТ» (25 YEARS). 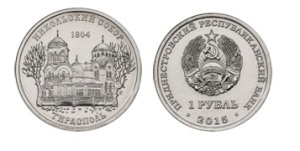 "10 Years from the date of the referendum on PMR independence and joining Russia"
The obverse: in the center - the image of the State Emblem of the Pridnestrovian Moldavian Republic; inscriptions along the rim - on top: «ПРИДНЕСТРОВСКИЙ РЕСПУБЛИКАНСКИЙ БАНК» (Pridnestrovian Republican Bank), at the bottom - the year of issue "2016"; at the bottom under the arms - the denomination "1 РУБЛЬ" (1 ruble)." The reverse: in the center - the image of the sign, symbolizing the choice at the referendum with the inscription "НАШ ВЫБОР РОССИЯ" (OUR CHOICE RUSSIA); at the top along the rim - the inscription "10 ЛЕТ РЕФЕРЕНДУМУ В ПМР" (10 Years of referendum in PMR). Series of coins "Orthodox Temples Pridnestrivie"
The reverse: in the center - the image of the monastery, above it - the inscription "1864-2014 gg" in a circle at the top - the inscription «СВЯТО-ВОЗНЕСЕНСКИЙ НОВО-НЯМЕЦКИЙ МОНАСТЫРЬ» (Holy Ascension Novo-Neamt monastery). "The Cathedral of the Transfiguration in Bendery"
The reverse: in the center - Cathedral of the Transfiguration in Bendery, above the inscription "СОБОР ПРЕОБРАЖЕНИЯ ГОСПОДНЯ г.БЕНДЕРЫ" (The Cathedral of the Transfiguration in Bendery); left - the inscription "1815-2015". The obverse: in the center - the State Emblem of the Pridnestrovian Moldovian Republic; along the rim - the inscription: at the top - «ПРИДНЕСТРОВСКИЙ РЕСПУБЛИКАНСКИЙ БАНК» (Pridnestrovian Republican Bank), at the bottom - the Year of issue "2015"; at the bottom under the arms - the denomination «1 РУБЛЬ» (1 ruble.). The reverse: in the center - the image of St. Nicholas Cathedral, over the inscription "1804"; along the rim - an inscription: at the top - "НИКОЛЬСКИЙ СОБОР" (St. Nicholas Cathedral) at the bottom - "ТИРАСПОЛЬ" (Tiraspol). The obverse: in the center - the State Emblem of the Pridnestrovian Moldovian Republic; along the rim - the inscription: at the top - «ПРИДНЕСТРОВСКИЙ РЕСПУБЛИКАНСКИЙ БАНК» (Pridnestrovian Republican Bank), at the bottom - the Year of issue "2016"; at the bottom under the arms - the denomination «1 РУБЛЬ» (1 ruble.). The reverse: image Cyril and Methodius Church, above it - the inscription "1997"; along the rim - inscriptions: at the top - "ХРАМ СВЯТЫХ РАВНОАПОСТОЛЬНЫХ КИРИЛЛА И МЕФОДИЯ" (Church of Saints Cyril and Methodius), at the bottom - "г. ДНЕСТРОВСК" (Dnistrovsk). The reverse: in the center - picture of a temple in the name of Sophia, the Wisdom of God, under it - the inscription "2016"; along the rim - inscriptions: at the top - " ХРАМ СОФИИ – ПРЕМУДРОСТИ БОЖИЕЙ" (TEMPLE OF SOFIA, WISDOM OF GOD), at the bottom - "СТРОЕНЦЫ" (Stroienti). The obverse: in the center - the State Emblem of the Pridnestrovian Moldovian Republic; along the rim - the inscription: at the top - «ПРИДНЕСТРОВСКИЙ РЕСПУБЛИКАНСКИЙ БАНК» (Pridnestrovian Republican Bank), at the bottom - the Year of issue "2017"; at the bottom under the arms - the denomination «1 РУБЛЬ» (1 ruble.). The reverse: in the center - the image of the Cathedral of All Saints, above it - the inscription "1797"; On a circle - inscriptions: at the top - "КАФЕДРАЛЬНЫЙ СОБОР ВСЕХ СВЯТЫХ" (CATHEDRAL CATHEDRAL OF ALL SAINTS), below - "г. ДУБОССАРЫ" (DUBOSSARY). The obverse: in the center - the State Emblem of the Pridnestrovian Moldovian Republic; along the rim - the inscription: at the top - «ПРИДНЕСТРОВСКИЙ РЕСПУБЛИКАНСКИЙ БАНК» (Pridnestrovian Republican Bank), at the bottom - the Year of issue "2018"; at the bottom under the arms - the denomination «1 РУБЛЬ» (1 ruble.). The reverse: in the center - the image of the the Сhurch of St. Andrew the First-Called, above it the inscription "1793"; on a circle - inscriptions: at the top "ЦЕРКОВЬ СВЯТОГО АНДРЕЯ ПЕРВОЗВАННОГО" (THE CHURCH OF THE HOLY ANDREW PREVIOUS), at the bottom - «ТИРАСПОЛЬ» (TIRASPOL). The reverse: in the center - the image of the Church of the Intercession of the Most Holy Mary, above it the inscription “1998”; in a circle - the inscriptions: at the top - «ЦЕРКОВЬ ПОКРОВА ПРЕСВЯТОЙ БОГОРОДИЦЫ» (THE CHURCH OF THE COAST OF THE BLESSED VIRGIN MARY), at the bottom - «г. ТИРАСПОЛЬ»(TIRASPOL). Series of coins "Cities Transdniestria"
The obverse: in the center - the State Emblem of the Pridnestrovian Moldovian Republic; along the rim - the inscription: at the top - «ПРИДНЕСТРОВСКИЙ РЕСПУБЛИКАНСКИЙ БАНК» (Pridnestrovian Republican Bank), at the bottom - the Year of issue "2014"; at the bottom under the arms - the denomination «1 РУБЛЬ» (1 ruble.). The reverse Tiraspol: in the center - a monument to AV Suvorov on the background of the plan Tiraspol fortress at the top - the Year of foundation of the city. The reverse Bendery: in the center - Bendery fortress, at the top - the Year of foundation of the city. The reverse Rybnitsa: in the center - the stele, an open book, which embodies the chronicle of the city, against the backdrop of a metallurgical plant, at the top - the year of foundation of the city. The reverse Dubossary: in the center - on the background of the stele Dubossary hydroelectric power station at the top - the Year of foundation of the city. The reverse Grigoriopol: in the center - Ascension Cathedral, at the top - the Year of foundation of the city. The obverse: in the center - the State Emblem of the Pridnestrovian Moldovan Republic; along the rim - the inscription: at the top - «ПРИДНЕСТРОВСКИЙ РЕСПУБЛИКАНСКИЙ БАНК» (Pridnestrovian Republican Bank), at the bottom - the Year of issue "2014"; at the bottom under the arms - the denomination «1 РУБЛЬ» (1 ruble.). The reverse Slobodzeya: in the center - the image of the sculptural group of farmers, at the top - the year of foundation of the city. The reverse Kamenka: in the center - the city House of Culture at the top - the Year of foundation of the city. The reverse Dnestrovsk: in the center - a monument on the background of Prometheus lines LEP, at the top - the Year of foundation of the city. Series "Pridnestrovie - native land"
Avers: in the center - the image of the State Emblem of the Pridnestrovian Moldovian Republic; in a circle - inscriptions: at the top - «ПРИДНЕСТРОВСКИЙ РЕСПУБЛИКАНСКИЙ БАНК» (PRIDNESTROVIAN REPUBLICAN BANK), in the lower part under the emblem - «3 РУБЛЯ» (3 RUBLES); below - "2018". 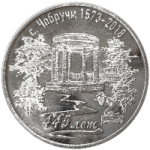 Reverse of the coin: in the center - the image of the rotunda and the sculpture "Жажда" (Thirst) in the park to them. D.K. Rodin, with. Chobruchi; above - the inscription «с. ЧОБРУЧИ 1573-2018» (v.CHOBRUCHI 1573-2018); below - the inscription "445 ЛЕТ" (445 YEARS). The reverse: "70 years of Great Victory": in the center - the image of the Order of the Second World War, on the rays of the star signs on the left - "1945" on the right - "2015"; at the top - the inscription "70 ЛЕТ"(70 years) at the bottom - the inscription "ВЕЛИКОЙ ПОБЕДЫ" (Great Victory); left and right - the stylized laurel branch. Series of "Military Glory Memorials Transnistria"
The reverse "Tiraspol Memorial of Glory": in the center - the image of the tank on a pedestal and the eternal flame in the memorial complex of Tiraspol, above it - the inscription "1945-2015" on a pedestal - the inscription "ВЕЛИКОЙ ПОБЕДЫ" (Great Victory), on the right - the inscription "70 ЛЕТ" (70 years) with a stylized laurel branch. The reverse: in the center - on the background of the stele inscriptions «НИКТО НЕ ЗАБЫТ, НИЧТО НЕ ЗАБЫТО» (Nobody is forgotten, nothing is forgotten), situated at the memorial to the eternal fire; at the top - the inscription "МЕМОРИАЛ СЛАВЫ "(Memorial of Glory); at the bottom - the inscription "РЫБНИЦА" (Ribnita). The reverse: in the center - the image of the memorial complex: big gun on a pedestal, the eternal fire and stele; at the top - the inscription "ПЛОЩАДЬ ГЕРОЕВ" (Heroes' Square), at the bottom - the inscription "г. БЕНДЕРЫ" (BENDER). The reverse: In the center - the image of eternal fire and stele with carved star and dates "1941-1945" against the background of two spruce, above - the inscription «МЕМОРИАЛ СЛАВЫ» (MEMORIAL OF GLORY), at the bottom - the inscription «г. ГРИГОРИОПОЛЬ» (GRIGORIOPOL). The reverse: In the center - an image of a monument to a Soviet soldier against the background of a bas-relief with fragments of battles, at the top - the inscription "МЕМОРИАЛ СЛАВЫ" (MEMORIAL OF GLORY), at the bottom - the inscription «г. КАМЕНКА» (KAMENKA). Out of series. "Graphical image of the ruble"
The reverse: in the center - a graphic image of the ruble, the circular inscription:"ПРИДНЕСТРОВСКИЙ РУБЛЬ" (Transnistrian ruble). The reverse: image sitting on the rocks with a snub-nosed monkey cub of China; Left in the background - a fragment of a "Chinese landscape"; above - hieroglyph symbol of 2016; at the top - the inscription "ГОД ОГНЕННОЙ ОБЕЗЬЯНЫ" (Year of the Fire Monkey) at the bottom - the inscription "2016". The reverse: in the center - a stylized image of a dog; to the right - a hieroglyph symbolizing the symbol of 2018, beneath - the inscription "2018"; above: from left to right - the inscription "ГОД ЖЁЛТОЙ СОБАКИ" (YEAR OF THE YELLOW DOG). The reverse: in the center - a stylized image of a boar; Above - the inscription «ГОД КАБАНА» (YEAR OF THE BOAR); on the right is the Chinese character for the Year; below - the inscription "2019". The reverse: the image of the zodiac sign Aquarius in the lower part of the coin along the rim inscription "ВОДОЛЕЙ AQUARIUS". The reverse: in the center - the stylized image of the zodiac sign of Pisces at the bottom of the coin - a circle inscription "РЫБЫ PISKES». The reverse: in the center - a stylized image of the sign of the Zodiac Aries, in the lower part of the coin - a circle inscription "ОВЕН ARIES». The reverse: in the center - a stylized image of the sign of the zodiac Taurus in the lower part of the coin - a circle inscription "ТЕЛЕЦ" (TAURUS). The reverse: in the center - a stylized image of the sign of the zodiac "БЛИЗНЕЦЫ" (Twins), in the lower part of the coin - a circle inscription "БЛИЗНЕЦЫ GEMINI». The reverse: in the center - a stylized image of the sign of the zodiac "РАК" (Cancer), in the lower part of the coin - a circle inscription "РАК CENCER». The reverse: in the center - a stylized image of the zodiac sign of "ЛЕВ" (Leo) in the lower part of the coin - a circle inscription "ЛЕВ LEO". The reverse: in the center - a stylized image of the sign of "ДЕВА" (Virgo) sign, in the lower part of the coin - a circle inscription "ДЕВА VIRGO". The reverse: in the center - a stylized image of the zodiac sign of "ВЕСЫ " (Libra) in the lower part of the coin - a circle inscription "ВЕСЫ" (LIBRA). The reverse: in the center - a stylized image of the zodiac sign of "СКОРПИОН" (Skorpio), in the lower part of the coin - a circle inscription «СКОРПИОН SCORPIUS» (SCORPIO SCORPIUS). The reverse: in the center - a stylized image of the sign "ЗМЕЕНОСЕЦ" (Ophiuchus) sign, in the lower part of the coin - a circle inscription "ЗМЕЕНОСЕЦ OPHIUCHUS". The reverse: in the center - a stylized image of the sign «КОЗЕРОГ», (Capricorn) sign, in the lower part of the coin - a circle inscription "КОЗЕРОГ CAPRICORNUS" (Capricorn Capricornus). 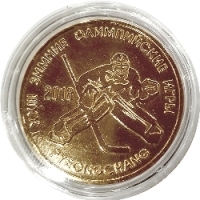 The reverse: in the center - the image of a hockey player with stick and puck on a background of sights of St. Petersburg; at the bottom - the inscription "ЧЕМПИОНАТ МИРА ПО ХОККЕЮ" (World Hockey Championship); right - the inscription: "2016", "РОССИЯ" (RUSSIA). 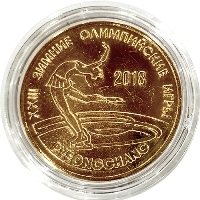 "XXIII Winter Olympic Games in South Korea"
The reverse: in the center - a stylized image of a snowboarder; on the right - the inscription "2018"; above - from left to right, the inscription "ХХIII ЗИМНИЕ ОЛИМПИЙСКИЕ ИГРЫ" (ХХIII WINTER OLYMPIC GAMES), at the bottom - the inscription "PYEONGCHANG". 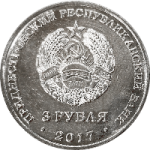 The reverse: in the center there is a stylized image of a skater on the ice, on the right is the inscription "2018", at the top there is the inscription «ХХIII ЗИМНИЕ ОЛИМПИЙСКИЕ ИГРЫ» (ХХIII WINTER OLYMPIC GAMES), at the bottom - the inscription "PYEONGCHANG". The reverse: in the center - a stylized image of a hockey player with a stick, to the left - the inscription "2018", at the top - the inscription «ХХIII ЗИМНИЕ ОЛИМПИЙСКИЕ ИГРЫ» (ХХIII WINTER OLYMPIC GAMES), at the bottom - the inscription "PYEONGCHANG". The obverse: in the center - an image of the State Emblem of the Pridnestrovian Moldovian Republic; in a circle - inscriptions: at the top - «ПРИДНЕСТРОВСКИЙ РЕСПУБЛИКАНСКИЙ БАНК» (PRIDNESTROVIAN REPUBLICAN BANK), at the bottom - the year of issue of the coin “2018”; in the lower part under the emblem - face value «1 РУБЛЬ» (1 RUBLE). The reverse:: in the center - the image of the rowers on the canoe, at the top - the inscription «ГРЕБЛЯ НА БАЙДАРКАХ». (ROWING ON THE BAYDARKS). "Modern Coats of Arms of Pridnestrovie"
The reverse: In the center - an image of the emblem of the town of Dnestrovsk, at the bottom there is an inscription - "ДНЕСТРОВСК". The reverse: In the center - the image of the coat of Arms of Grigoriopol, at the bottom - the inscription "ГРИГОРИОПОЛЬ" (GRIGORIOPOL). The reverse: In the center - the image of the coat of Arms of Kamenka, at the bottom - the inscription "КАМЕНКА" (KАMЕNKA). The reverse: In the center - the image of the coat of Arms of Tiraspol, at the bottom - the inscription "ТИРАСПОЛЬ" (TIRASPOL). The reverse: In the center - the image of the coat of Arms of Bendery, at the bottom - the inscription "БЕНДЕРЫ" (BENDERY). The reverse: In the center - the image of the coat of Arms of Dubossary, at the bottom - the inscription "ДУБОССРЫ" (DUBOSSARY). The reverse: In the center - the image of the coat of Arms of Ribnita, at the bottom - the inscription "РЫБНИЦА" (Ribnita). The reverse: In the center - the image of the coat of Arms of Slobozia, at the bottom - the inscription "СЛОБОДЗЕЯ" (Slobozia). "55 Years of the first manned flight into space"
The reverse: in the center - the image of the rocket, the envelope of the Globe; top - a circumferential inscription "ПЕРВЫЙ ПОЛЁТ ЧЕЛОВЕКА В КОСМОС" (The first flight of man in space) in the center - the inscription "55 ЛЕТ" (55 years). The reverse: in the center - a portrait of Zander F.A . ; on the right - the image of flying machines, against the background of stars, at the top the inscription "Ф.А. ЦАНДЕР", at the bottom - the years of life "1887 - 1933". The reverse: in the center - a portrait of K.E.Tsiolkovsky, on the right - the image of Space vehicles and the planet Earth, executed in color, against the backdrop of stars with inserts of two semiprecious stones, at the top - the inscription "К.Э. ЦИОЛКОВСКИЙ" (K.E. Tsiolkovsky), at the bottom - the years of life" 1857-1935 ". The reverse: in the center - the image of an artificial satellite flying around the planet Earth, at the top - the inscription "ПЕРВОМУ СПУТНИКУ" (FIRST SATELLITE), at the bottom - the inscription "60 ЛЕТ" (60 YEARS), on the right - the image of a carrier rocket against the background of stars. The reverse: portrait of Koroleva S.P., on the right - an image of a space rocket against the background of stars, at the top - an inscription "С.П. КОРОЛЁВ" (S.P. KOROLEV), below - Years of life" 1907-1966 ". The reverse: on the right - a portrait of a woman-cosmonaut Valentina Tereshkova. in a helmet against the background of stars; on the left - the inscription «55 ЛЕТ» (55 YEARS), in a circle - the inscription: «ПОЛЁТА ПЕРВОЙ ЖЕНЩИНЫ-КОСМОНАВТА В.В.ТЕРЕШКОВОЙ» (THE FLIGHT OF THE FIRST WOMAN-COSMONAUTIC V. V.TERESHKOVA). The obverse: in the center - the State Emblem of the Pridnestrovian Moldovian Republic; along the rim - the inscription: at the top - «ПРИДНЕСТРОВСКИЙ РЕСПУБЛИКАНСКИЙ БАНК» (Pridnestrovian Republican Bank), at the bottom - the Year of issue "2017"; at the bottom under the arms - the denomination «3 РУБЛЯ» (3 ruble.). The reverse: in the center - an image of a stylized sickle and hammer; above - the inscription "100 ЛЕТ" (100 YEARS) on the background of a star with rays; on the right - the inscription "ВЕЛИКОЙ ОКТЯБРЬСКОЙ СОЦИАЛИСТИЧЕСКОЙ РЕВОЛЮЦИИ" (GREAT OCTOBER SOCIALIST REVOLUTION); on the left - a laurel branch. The avers: in the center - the State Emblem of the Pridnestrovian Moldovian Republic; along the rim - the inscription: at the top - «ПРИДНЕСТРОВСКИЙ РЕСПУБЛИКАНСКИЙ БАНК» (Pridnestrovian Republican Bank), at the bottom - the Year of issue "2017"; at the bottom under the arms - the denomination «1 РУБЛЬ» (1 ruble.). The reverse: in the center - a portrait of F.E. Dzerzhinsky, on the left - the inscription "1917-2017", at the top - the inscription "ОРГАНАМ ГОСУДАРСТВЕННОЙ БЕЗОПАСНОСТИ" (STATE SECURITY); below - the inscription "100 ЛЕТ" (100 YEARS). "The Red Book of Pridnestrovie, Fauna"
The revers: in the center - a close-up image of the swan-shypun, at the top - the inscription «КРАСНАЯ КНИГА ПРИДНЕСТРОВЬЯ» (RED BOOK OF PRIDNESTROVIE), at the bottom - the inscription «ЛЕБЕДЬ ШИПУН – CYGNUS OLOR» (SWAN SHIPOON - CYGNUS OLOR).. The avers: in the center - the State Emblem of the Pridnestrovian Moldovian Republic; along the rim - the inscription: at the top - «ПРИДНЕСТРОВСКИЙ РЕСПУБЛИКАНСКИЙ БАНК» (Pridnestrovian Republican Bank), at the bottom - the Year of issue "2018"; at the bottom under the arms - the denomination «1 РУБЛЬ» (1 ruble.). The revers: in the center is a close-up stylized image of a sturgeon, on the right is a graphic image of the book, under it is the inscription "ACIPENSER GUELDENSTAEDTII BRONDT ET ROTZEBURG", at the top is the inscription «КРАСНАЯ КНИГА ПРИДНЕСТРОВЬЯ» (RED BOOK OF PRIDNESTROVIE), at the bottom is the inscription «ОСЁТР РУССКИЙ» (STURGEON RUSSIAN). The revers: in the center - the image of a butterfly Adam's head; on the right - an image of a flower and a caterpillar; at the top - the inscription «КРАСНАЯ КНИГА ПРИДНЕСТРОВЬЯ» (RED BOOK OF PRISNESTROVIE), at the bottom - the inscription “sphingidae”. The revers: in the center - the image of two woodpeckers and a tree; above - the inscription «КРАСНАЯ КНИГА ПРИДНЕСТРОВЬЯ» (RED BOOK OF PRISNESTROVIE); at the bottom - the inscription «ЗЕЛЁНЫЙ ДЯТЕЛ – PICUS VIRIDIS» (GREEN WOODPECKER - PICUS VIRIDIS). The revers: in the center - an image of an otter lying on the shore of a reservoir; above - the inscription «КРАСНАЯ КНИГА ПРИДНЕСТРОВЬЯ» (RED BOOK OF PRISNESTROVIE"; below - the inscription (LUTRA LUTRA OUTTER). The revers: in the center - the image of a tortoise in the thickets of cattail; at the top - the inscription «КРАСНАЯ КНИГА ПРИДНЕСТРОВЬЯ» (RED BOOK OF PRISNESTROVIE); below - the inscription «ЧЕРЕПАХА БОЛОТНАЯ – EMYS ORBICULARIS» (SKULLS MALF - EMYS ORBICULARIS). The revers: in the center - a stylized image of an eagle owl; on the right - an image of a soaring eagle owl, at the top - the inscription «КРАСНАЯ КНИГА ПРИДНЕСТРОВЬЯ» (RED BOOK OF PRISNESTROVIE), below - the inscription «ФИЛИН BUBO BUBO» (FILIN BUBO BUBO).